I was thinking about what to post a few weeks ago and decided that I don't do enough tags. And I don't know why not. Tags are so much fun! 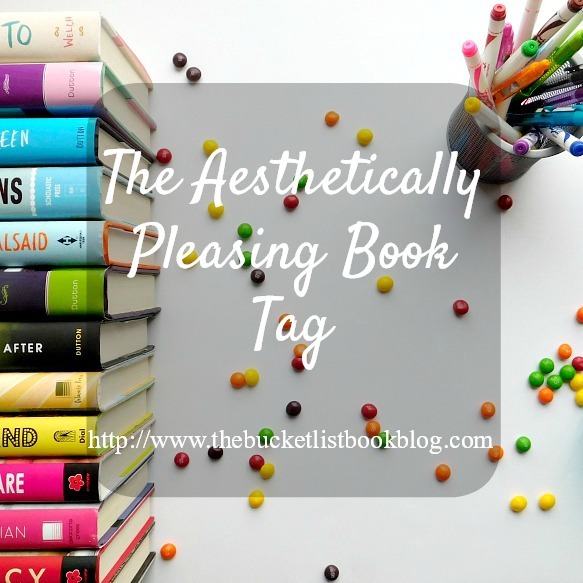 I saw this tag: the aesthetically pleasing book tag over at Bookmark Lit. It's a tag primarily focusing on how pretty book covers are. Believe me, there are some gorgeous books out there. I may have gotten a little carried away with this tag because, of course, I couldn't pick just one. There are simply so many beautiful covers that it was even difficult to only pick three. Looking at some of my favorite color combinations side by side, it's still hard to say what I like most about each of them. You rarely see orange on covers so the orange ombre on Flame in the Mist by Renee Ahdieh is so elegant. Also, I love bold choices-- color combinations that you don't think would work but do. This happens with The Ring and the Crown by Melissa De La Cruz where you wouldn't think the wall would match with the model's hat but I think it totally does. And so many colors are splattered on Big Magic By Elizabeth Gilbert in such an intentional and pretty way. I choose all the books. Seriously, it was hard to narrow down to just three for this. A Thousand Nights by E.K. Johnston has one of the most beautiful typography I've ever seen. If you look closely, the wisps of magic on the cover also say words too. I could stare at that cover all day. Also, I love pretty scripts like on the Until We Meet Again by Renee Collins cover. And I love how they made a dragon from the "s" on the Fantastic Beasts and Where to Find Them by J.K. Rowling. Do these covers count as simple? I adore when publishers capture the essence of the book without crowding the cover. In Three Dark Crowns by Kendare Blake, there are three sisters which each of the crowns represent perfectly. In Love and Gelato by Jenna Evans Welch, there is a lot of gelato eating (who knew? 😛). And, well, I just like the clouds on The Fault in our Stars by John Green. My favorite endpages have got to be the Red Queen series by Victoria Aveyard (middle). They are so fancy and every time I look at them, I notice something different. However, I love the vintage wallpaper endpages in the Miss Peregrine's Home for Peculiar Children series by Ransom Riggs (left). I wish that the Lunar Chronicles were consistent in their endpages but, unfortunately, we only got the gorgeous backdrop of Lunar on Fairest (upper right). Honorable mention goes to Winter by Marissa Meyer (bottom right) which features a bunch of fanart from the series. The map for Carry On by Rainbow Rowell (upper left) is so fun and colorful. A 3-D map of school grounds is not something readers see often so I thought it was definitely worthy of being a 'best map.' The map in A Court of Thorns and Roses by Sarah J. Maas (lower left), by itself, is pretty but so are all the maps. What is really awesome about this map is that as the series continues with A Court of Mist and Fury and A Court of Wings and Ruin, the maps in the books change according to what you and the protagonist know about the lands. Cool! I just happened upon These Shallow Graves by Jennifer Donnelly (right) and noticed its pretty map of New York City. I like how the map is faded in some parts or the writing is a bit smudged. Once again, if the cover connects to the story in some way, it makes me so happy. In the case of Passenger by Alexandra Bracken (left), the tree is described to be on their family crest. Heartless by Marissa Meyer (middle) is a retelling of the Queen of Hearts so the hardcover definitely ties into that. Truest by Jackie Lea Sommers (right) is a fantastic novel. Though, it's super hard to see, there are words on the naked hardcover in gorgeous font. Very wonderful! Not only do great books have a story inside them but the best ones tell stories even before you read them, on the cover. With Since You've Been Gone by Morgan Matson (left), it pushes you to ask questions like "Why would they leave an open pizza box laying on the ground?" You know someone is going to get off the table and step right in the pizza. Or the back cover of Beauty Queens by Libba Bray (middle) which makes you want to know more about when and why did the plane crash. Oh, and To All the Boys I've Loved Before by Jenny Han (right) has the cutest cover that always makes me a little bit room-jealous. I cheated with this one since there aren't many chapter headers in the anthology, Summer Days and Summer Nights edited by Stephanie Perkins (left). However, the short story headers are super cute! As is both Chris Colfer's The Wishing Spell (right) and the entire Harry Potter series by J.K. Rowling (middle). Finding illustrations in books that are not considered graphic novels or picture books are always something of a treat. My favorite illustrations are those in Ink by Amanda Sun (left) and A Monster Calls by Patrick Ness (middle). Most recently, I finished Beauty and the Beast (right) and the illustrations in that edition was so gorgeous! I love when you take the book jacket off and underneath is a beautiful, shiny spine. Reawakened by Colleen Houck and Alice in Zombieland by Gena Showalter have the most pretty spines. Extraordinary by Nancy Werlin is a gorgeous spine too and you don't even have to take off the jacket. All of the books on my shelves are my favorite. I can't choose; they're all so pretty! I love the cover of Hourglass by Myra McEntire; the model is just chilling on the wall as if gravity doesn't matter. I never know what to look at with All Our Yesterdays by Cristin Terrill, there's so much going on. And Jackaby by William Ritter; I'm in love with the font but also how the red and blue definitely work together. So pretty. This is such a fun tag! I tag you, if you want to do this tag. What is your favorite book cover? This is such a cool tag! You picked some absolutely gorgeous books. My favourite cover is definitely the Hardcover version of Blue Lily, Lily Blue by Maggie Stiefvater. It is just so beautiful. I think I might have to save this tag for when writers block hits next, haha. Your pictures are amazing! There are so many beautiful covers coming out (especially lately) and you highlighted so many of them. I'm totally going to be doing this tag ASAP. Awesome post, Jeanna! What a fun tag! SO many beautiful covers!! I'm a big fan of typography/font, and you chose such great examples!